If you have an iPod Video (5G), and want to quickly convert your existing QuickTime movies so you can watch them on your iPod, here's how to to do so using iTunes 6 or later. Use the "Add to Library..." command to bring your movie into iTunes. Click once on the movie to highlight it. Choose Advanced > Convert Selection for iPod. Go to "File > Get Info. Add information in the Name, Artist, and Comments fields. Choose "Video" for the Genre. Now connect your iPod video and sync. 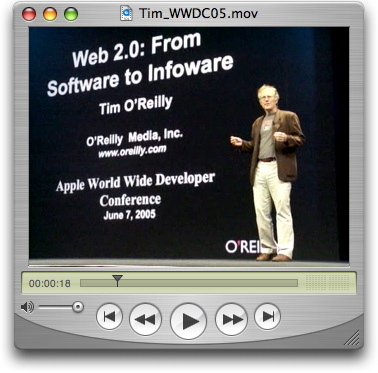 If you'd like to see a sample movie created by this method, download a clip of Tim O'Reilly speaking at WWDC '05 (1:47, 9 MBs). The original clip was captured with a Casio Exilim EXP505 digital camera. If you think about it, this is amazing technology we have. You can capture movies with your compact digital camera, rip them in the free iTunes application, then upload and playback on your iPod video. Wow! PS3 is waay better than xbox 360. free online play? need i say more? also, metal gear! I hope they make a new metal gear for the psp! was very pleased to find this site.I wanted to thank you for this great read!! I definitely enjoying every little bit of it and I have you bookmarked to check out new stuff you post. This page wasnt working earlier i tried accesing it but it timed out 4-5 times now i can access it. Whats going on? This page wasnt working earlier i tried accesing it but it timed out 4-5 times now i can access it. Why Does this happen? Am i the only one having this issue? What's happend? I have to keep Refreshing the page to even be able to view the post can someone fix this issue please? This is awesome! Im bookmarking this to share with my son! Thank you thank you thank you! Found a really great World of Warcraft guide! I definitely feel it was worth the money and am recommending it to everyone. I'd been tempted by the gold selling sites several times and yesterday.... was starting to look at them seriously for the first time. Definately worth it. I wanted to thank you for this good read!! I definitely appreciate every tiny bit of it :) I have you bookmarked for me to check out every latest stuff you post easier to made sure I wont miss one of it. Apple iPad desktop chargers provide an essential link between Apple iPad and computer, allowing you to charge, synchronize and keep your phone up-to-date. It also allows charging of an additional or spare battery.